Hospital admissions for children with asthma peak every September. 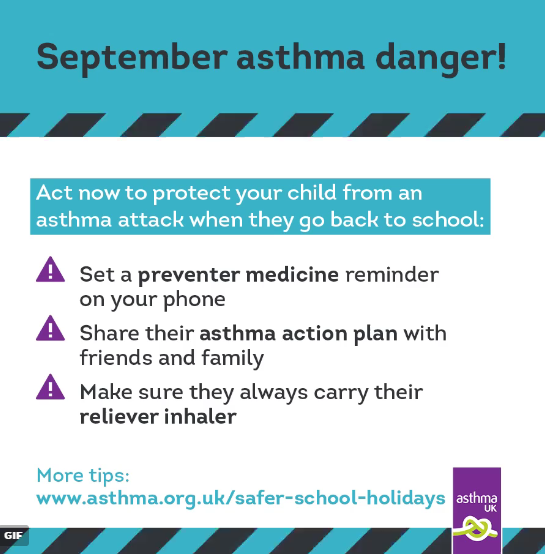 Asthma UK have formulated 3 top tips for parents to cut their child’s risk of an asthma attack when they go back to school in September. There is also a video in which a GP shares advice on how to keep your child well over the holidays. A healthcare professional could share this advice with a parent during a consultation by printing the tips from the website or sharing the video.